Oh No! Do I Have Mice In My Home? Sharing your house with rodents and furry critters of the pests may not be the way you wish to manage your household. Not only are they unhealthy, but they can also be destructive with chewing items while foraging for food and shelter throughout the crannies of your home. When mice invade your home, you may panic, and you do not know how to go about it. This article offers you information about what you need to know about mice invasion in your home. Despite being unpleasant, it is possible to find and eliminate rodents. Mice, other than being opportunists, are determined. They will look for any defect in your home or house to gain access. For this reason, you have to be cautious and try being a DIY King in your home to seal each gap, plug each hole and repair any damaged property. How do mice get into your home? Corner posts are fitted to finish the ends of sidings at the corner of a house, and the j-channels are installed around windows and doors to conceal the ends of vinyl siding. These hollow posts make it easy for mice to gain access to your home by climbing up the sides and getting through the gaps between the j-channels since the sidings are large enough for mice. If you have uneven garage doors or you leave the door open for long, or if you have clutters in your garage there is a good chance that you will attract the unwanted house-guests. This is a common name used to refer to the slanted cellar door which leads to the basement. The gaps between the doors are a great opportunity for the mice to get in. 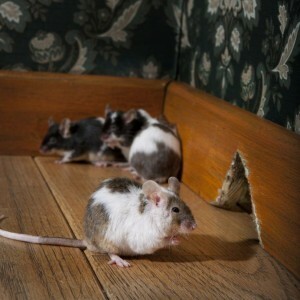 The rodents can get into your home through cracks in your foundation. It happens especially for the stacked stone and rubble foundations since they are susceptible to gaps large enough for mice to get through. These rodents can quickly climb up along the gutters and downspouts gaining access to any openings near the roof of the house. Mice are good climbers, and they can quickly go through the chimney holes to enter your house. If the droppings are fresh, they are dark and moist, and as they age, they dry out and turn gray. You can find the droppings near food packages, under sinks, in drawers, and near any rodents’ runways. Other than the droppings, you can identify the pests by gnawing markings. They are light in color, and as they age, they become darker. You can find them on food packaging or other things packaged in the house. If the gnaw marks are light in color, it is a sign that the infestation is continuing. You will discover that pets will seem active and excited near areas where rodents are present. This is because of mice’s odor which is likely to occur if the rodents have been in your structure recently. If you discover your dog or cat pawing at areas they had no interest before, examine it for mice. You can also identify the stale smell from hidden areas if there is an active infestation. Mice will use materials like fabric, dried plants, and shredded paper to build nests. If you discover any of the mentioned signs, there is likelihood that there is a nest somewhere in the house where they hide after destruction. Seal any holes inside and outside your home to keep the rodents out. These include plugging holes with wool and repairing any cracks on the walls. Having a mice infestation in your home is a health threat. It carries numerous diseases and leads to the spread of viruses and germs through food contact. The bacteria are spread through bites and droppings. Also, they pose other threats like an electrical fire. They are known for gnawing through electrical wires which could cause a fire. They also attract other parasites like ticks and fleas. Given the mentioned threats and more, it is evident that mice infestation is a great loss for you. Do not hesitate to call a pest control professional near you to help examine, identify and get rid of the mice as soon as possible. Request a free termite inspection online, call us at 888-945-2847 or visit our contact page. All of our termite inspections are no obligation and 100% free!